Uncle Chico argue against with education, respect, knowledge and historical basis the presentation of the new thesis on a new canine type called OFB, which was made publicly available on the web. Question # 461: Uncle Chico, I really liked yours last 4 articles, showing solid arguments with the incongruities in the new thesis that intends to reinvent and re-manufacture the traditional and original Fila Brasileiro that has lived in our country for so many years. That is, the Brazilian breed that was rescued from the extinction by CAFIB more than 40 years ago, in view of the practice of miscegenation practiced by unscrupulous breeders who falsified pedigrees and which had the institutional and systemic connivance of BKC, CBKC and FCI since the 1970s and has been preserved in its breed purity to this day with complete success by CAFIB founders, directors, judges and breeders. 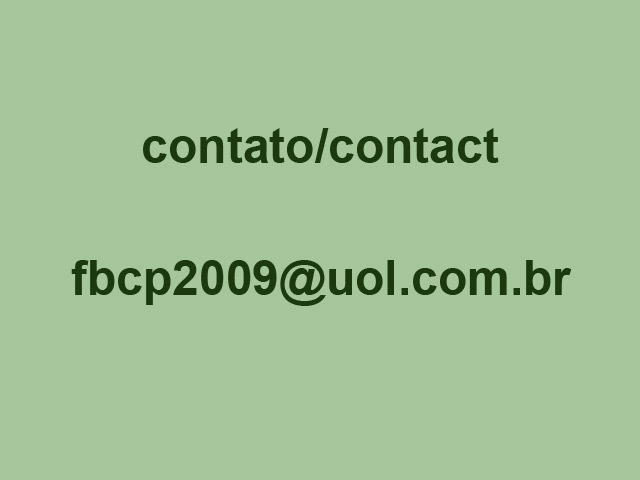 So, I would ask you to comment not only on this new presentation of this new OFB thesis that was publicly available on the web via the link https://pt.wikipedia.org/wiki/Original_fila_brasileiro , as well as commenting on the total lack of arguments of the defenders of the new OFB that, instead of disagreeing with yours arguments, only try to attack you personally via Facebook posts, which, let’s face it, makes no sense and was used without success by some members of the late Anfibra. Too bad these people do not accept the diversity of opinions, the contradictory and do not know to debate with facts, arguments, documents, education and respect. Tanks a lot. Uncle Chico’s Response: I am very sorry that after 40 years of CAFIB’s rescue the FB from extinction, some people still waste their time trying to create new theses without any basic and elementary evidence, much less practical knowledge, based on the simple guesswork about the well-known, traditional, classic, popular, original and unique Fila Brasileiro. I am also sorry that after the end of the Anfibra that only tried to copy the CAFIB, the inoperative and the limbo where the SPFB remains and the absence of Unifila for so many years, some people try to create and invent another division in the Fila Brasileiro. Important note, mainly for the functional illiterates: the part of the text below that is in blue/black, italics, bold, in thesource Comic Sans MS and in quotes is posted by the proponents of the new OFB thesis in the above mentioned link. 1.1. How do these defenders prove to be a “…breed…”, that is, a group of dogs with a type for years properly defined and fixed? 1.2. How they prove the existence of these dogs in fact in “…farms in the interior of Brazil…” and, especially, that these dogs were never crossed with dogs of other breeds or even with mutts, thus having their genetics and breed purity altered and, therefore, miscegenated? 1.3. Why do they not present with proper transparency the name and photos of such dogs, informing the name and location of the farms and their farmers-breeders names in which they were found, thus proving that they are not CAFIB Filas or CBKC –FCI Filas and “filas” ? 1.4. Why do not they present photos of these dogs with their data, description of their phenotypes and evaluation summaries, in addition to their SOBRACI records ? After all, how to rescue or maintain a particular dog type without a strict, serious, reliable and available genealogical control with transparency for those interested? 1.5. 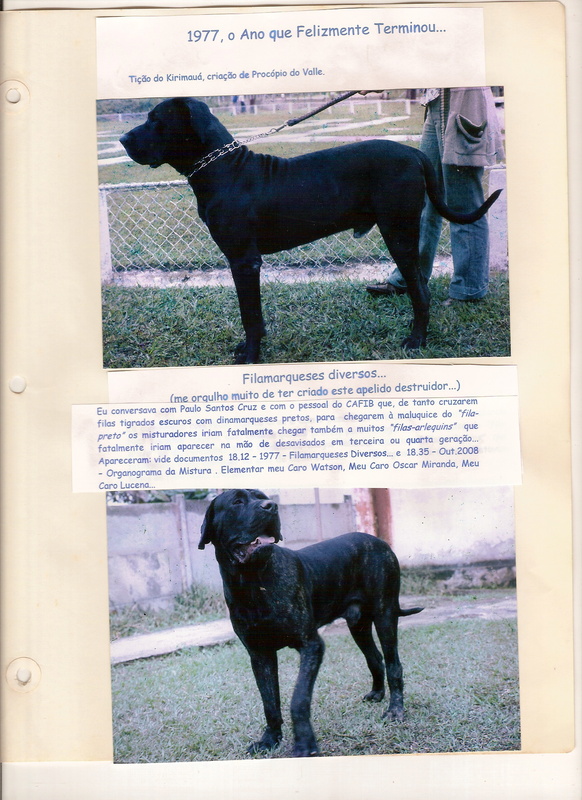 And, more importantly, whether it is true or not that the proponents of the new OFB thesis also cross these dogs for them existing in “…farms in the interior of Brazil…” with Fila Brasileiro breed and registered in the CAFIB and even with CBKC-FCI Fila and “filas” who have good typicity, and whose phenotypes would be approved in an CAFIB APT ( Analyses of Phenotype and Temperament) ? 2.1. 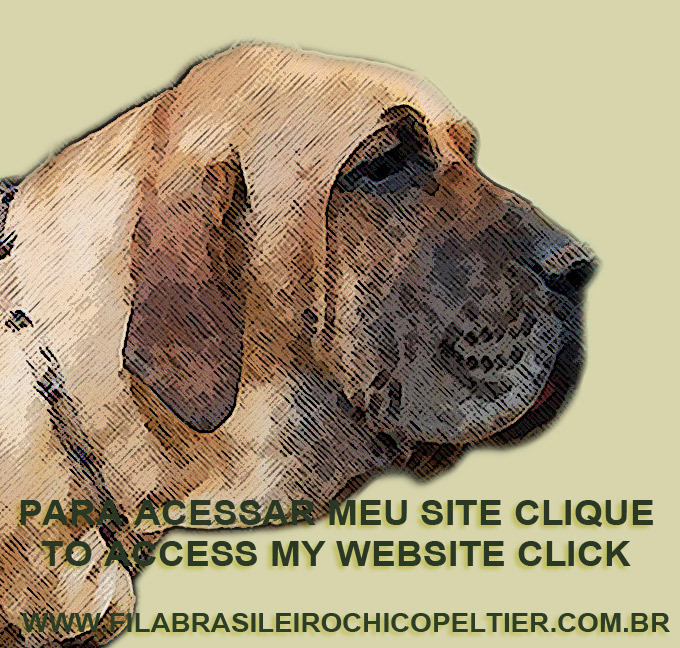 Does SOBRACI (a also register the traditional and True Fila Brasileiro? Is it from the CAFIB or even the Typical Fila existing in CBKC-FCI ? 2.2. If positive, how does this Dog Registry differentiate these three types of FB? 3.1. In this book with 371 pages in none of its lines Mr. Procópio do Valle had the courage to defend and expose its “brilliant” … thesis in defense of the existence of the so-called “black-fila“. That is, did not have the courage to expose his “wonderful genetic work” …, thus losing “magnificent opportunity” … (??? !!!) to prove the rescue he performed of the black color in the FB. .. Really unbelievable…!!! 3.2. 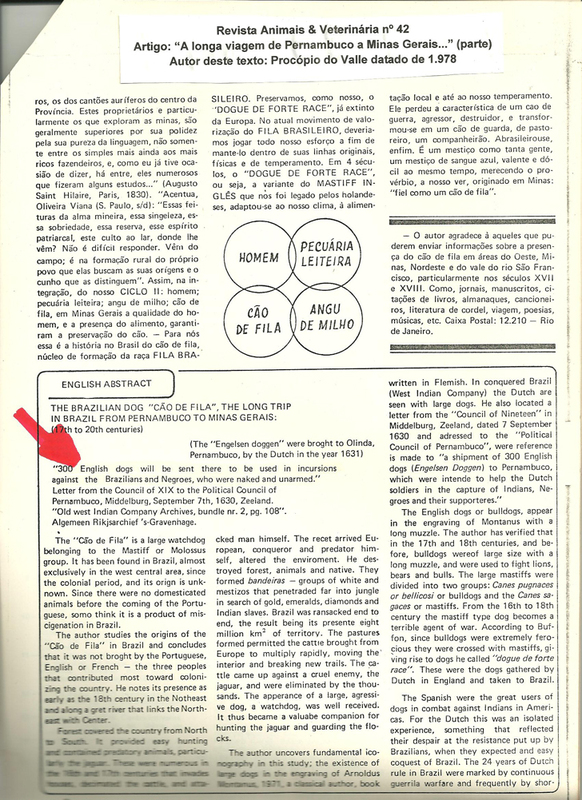 More importantly, Mr. Procópio do Valle, known as the “Father of the Black Fila“, defended a totally opposite thesis presented by the defenders of the OFB thesis when they affirm in this link about the dog denominated Portuguese Alão or others originating from the Iberian Peninsula and that this one perhaps, who knows, however, could have been “…a probable ancestor of the queue dogs of Brazil…”. Note: please, do not be lazy to read and study. Especially the defenders of the OFB. 3.4. In the same way that I have already proved the lack of dogs brought by the Dutchmen led by Mr. Mauricio de Nassau who invaded Brazilian Pernambuco State, located in the Northeast of our Country in the year 1637, it being enough to read and study in https://filabrasileirochicopeltierblog.wordpress.com/2014/11/15/post-no-227-tio-chico-informa-no-79-academico-e-estudioso-em-mauricio-de-nassau-enviado-em-151114/ as mistakenly defended by Mr. Procópio do Valle, I inform the proponents of the OFB thesis that Portuguese dogs called Rafeiro Alentejano, Serra da Estrela Dog, Portuguese Water Dog, Portuguese Perdigueiro, Portuguese Podengo, Serra de Aire Dog, Castro Laboreiro Dog , Barbado da Terceira, Transmontano Cattle Dog, Algarrobo Barrocal, and especially the Fila de São Miguel, all have a small triangular head, as well as a long and light body (see in https://www.youtube.com/watch?v=24lWlrX3JiY ). 3. 5. As for the Spanish dogs a mention the Bodeguero Ratonero of Andalusia and the Spanish Greyhound both with extremely triangular heads; the Spanish Water Dog, which is also small and triangular in head shape, the Spanish Alano which, because it is considered a modern breed, is inadequate to the period of formation of the FB, besides also having a triangular head. And, going further, the Spanish Mastiff, despite having a head also triangular, but of greater size and more proportional to his body by the larger size, would be the only Iberian dog that from far, far away, would remember – just the touching to his strong body – that of the FB. But there is also no record of the arrival of Spanish dogs in Brazil. 3.6. However, as I have commented on other occasions, I have researched hundreds of times about dogs from the Iberian Peninsula, and I have never found a single record even that these dogs were brought by the Portuguese to Brazil and even less by the Spaniards. Therefore, I am waiting for the defenders of OFB to prove the opposite of what I am saying here. I visited personally the National Palace of Mafra, located in the Portuguese city of the same name, which has one of the most important Portuguese libraries and from where the Portuguese nobility with Dom Joao VI set out to settle in Brazil escaping from the Napoleonic judgment. I searched there and found nothing. Therefore, I hope that the proponents of the OFB thesis will not bother to inform all the FB and “fila” breeders in Brazil and abroad in which fact and proven historical fact they are based to affirm that the Portuguese Alão or any other dog coming from the Iberian Peninsula has been “...a probable (???) ancestral of the FB of Brazil“. 4. In the photo below, even of poor quality, posted on the link in question, despite lacking the names of the dogs, place and date, I ask what the difference of the phenotypes presented in these dogs compared to the Pure CAFIB Fila and the Typical Fila registered in CBKC-FCI? 5. The defenders of the OFB thesis claim in this link that “…there was the need to preserve the old dog that gave birth to the modern Brazilian Fila“. However, to the best of my knowledge, this need was noted by me as soon as I became acquainted about the miscegenation in 1974-76, that is, more than 40 years ago, and began my solitary campaign to combat it even before the foundation of CAFIB and which culminated in the fact that I was able to convince Dr. Paulo Santos Cruz in 1976 to return to cynophilia and FB (see http://www.filabrasileirochicopeltier.com.br/4-Documentos-de-1975-e-1976/4-17.jpg ) and the founders of CAFIB just over 40 years ago. 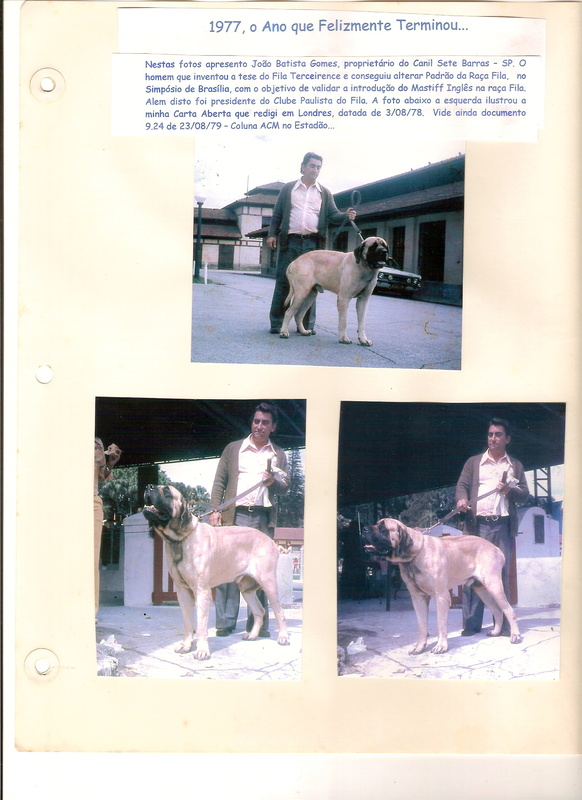 These CAFIB founders and breeders who undoubtedly were responsible for having rescued in practice the True Fila Brasileiro of miscegenation and extinction. Therefore, I understand to be extremely late, out of time and lacking the due temporal nexus, this conclusion arrived only now in 2018 by the defenders of the OFB thesis. That is, with another 40 years of delay !!! Difficult to understand how these people have waited more than 4 decades to realize that, for them, Fila Brasileiro is not Fila Brasileiro, but rather OFB !!! ??? 6. Regarding the origin of the FB I inform that, to my knowledge, CAFIB has never expressed opinions, theses and hypotheses about the origin of the FB. Personally I understand that it is lost and will remain unreachable in the South of Minas Gerais. I believe that even the earliest known FB breeders, such as José Gomes de Oliveira, Zezeca and Pedrinho do Engenho, both of the Junqueira Family, never knew the true origin of the FB. 7. The defenders of the OFB thesis claim in this link that “…Filas like this (the below and the left) with a good part of the white body with markings of colors on the head probably (???) have some ancestor with the Dog of Transmontano Cattle… “. So, I ask my readers: do you think these two dogs whose photos follow below, being the left photo of an OFB posted on this link and the one from the right of a Transmontano Cattle Dog of similar phenotype? Or the coloring of the dog on the left reminds any dog, purebred or not, mutt or not, predominantly white? Not to mention the triangular head of the Transmontano Cattle Dog !!! See more photos of this Portuguese dog in https://www.google.com/search?biw=1455&bih=689&tbm=isch&sa=1&ei=9oYmXKHgGoa2wQSi96jACA&q=c%C3%A3o+de+gado+transmontano&oq=C%C3%A3o+de+gado+transmontano&gs_l=img.1.0.0j0i30l7j0i5i30j0i8i30.71084.71084..73007…0.0..0.102.102.0j1……1….1j2..gws-wiz-img.v0tkS9TEiWQ and draw your own conclusions !!! My readers, do you really believe that the Transmontano Cattle Dog with this triangular head and light up and right is the origin of the formation of the Fila Brasileiro? 9. The defenders of the OFB thesis when believing based ONLY “…in their own personal experiences (??? !!!) with the breed (FB) …” and that for this reason they arrived to “…the conclusion that there was a need to preserve the ancient dog that gave birth to the modern Brazilian Fila…” because “…the old or original fila is coming close to extinction due to practices of crosses that have attached genetics and breed characteristics foreigners unrelated to the Brazilian endemic dog“, can only be referring obviously to the Fila registered in the CBKC-FCI miscegenated, atypical and heterogeneous and it seems to me that unbelievably forgotten the PURO CAFIB Fila. 10. In this link the defenders of the OFB thesis further affirm that the origin of the FB would be in such a disappeared “…Iberian Allan (although this dog is totally unknown and without any registration in Google as in Wikipedia !!!) consequently, of the molosso type dogs of Portugal and Spain… “. However, as far as my knowledge goes, and if I am wrong, I would ask them to prove otherwise, there has never been any dog in Portugal that could be designated as Molosso. Neither in Spain, except the (*) called Spanish Mastiff that is not stubborn and has triangular head. See in https://www.google.com/searchq=mastim+espanhol&source=lnms&tbm=isch&sa=X&ved=0ahUKEwin5eLcscPfAhUEI5AKHZBOApcQ_AUIDigB&biw=1455&bih=689 . From this sentence posted in this link follows long, beautiful, romantic, but totally unproven and a lot of imaginative series of assumptions without any historical proof. 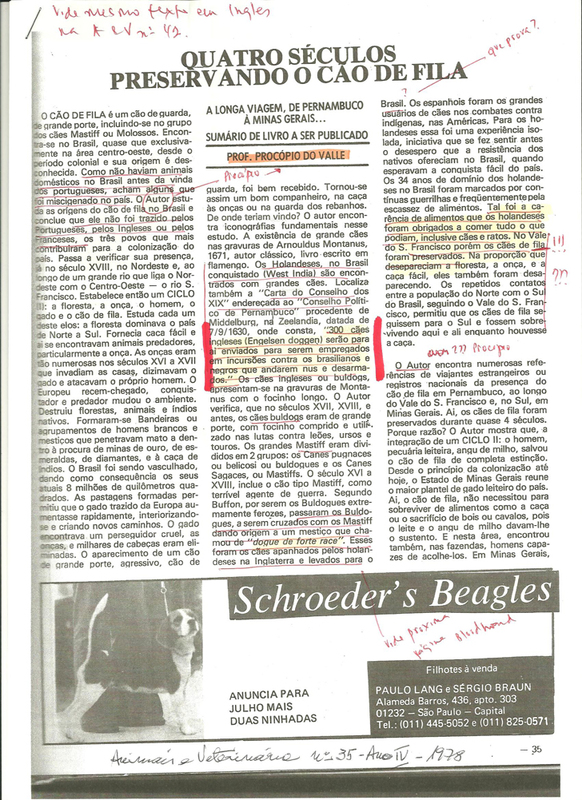 Recalling unfortunately the thesis of Fila Terceirense and Dogue de Forte Race…. 11. In this link proponents of the OFB thesis comment on the “…extremely functional and non-stocky structure of the old filas (??? ), in addition to the proportional snout according to the OFB standard.” However, the picture below to the left, which I understand to be an example of an OFB dog, with the characteristics proclaimed just above in this item by them, reminds me only of a poor German Dog. And for you? I request to compare with the two photos in the center and in the right of a German Dog. 12. 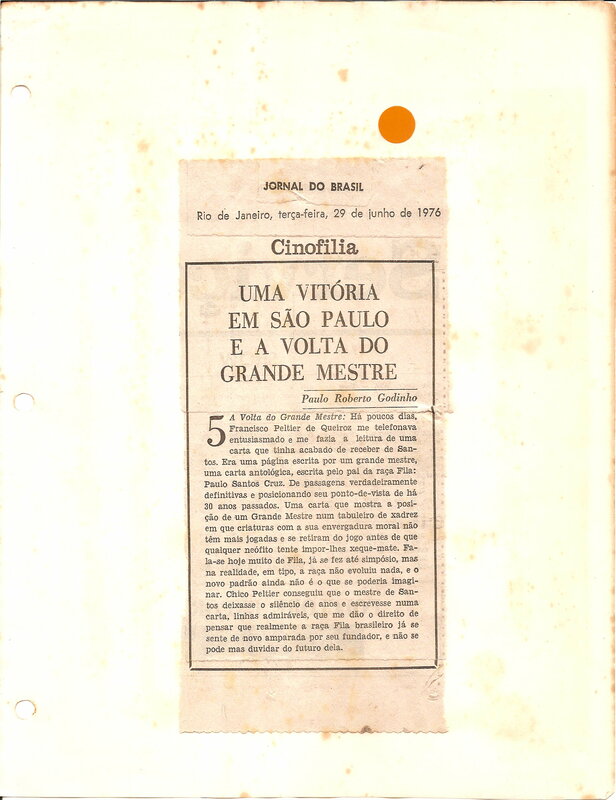 In this same link, the defenders of the OFB thesis further affirm that they studied “… the probable origins of the Fila Brasileiro under the guidance of Mr. André Oliveira and Mr. Antônio Ferreira – Portuguese, dog enthusiastic and researchers of the University of Coimbra of Portugal – who provided rich materials of studies, many historical documents and photos of old Portuguese dogs, among them the Portuguese Alão of the end of the 19th century and beginning of the 20th century.” Very interesting… But the concrete fact contained in this statement — for the most attentive readers, with power of criticism, analysis and who are not functional illiterates — is that, no doubt, at no time these two Portuguese dog fans absolutely nothing presented that proves the shipment and arrival in Brazil of Portuguese or Spanish dogs !!! That is, the observation noted above by those who believe in the OFB is profoundly vague and devoid of relevant substantiation and prove. That is, exactly like Mr. Procopio do Valle in his article published in the magazine Animals & Veterinary # 35, dated Dec-78 where he stated totally devoid of contact with reality in his article entitled Four Centuries Preserving the Fila Dog (see in www.filabrasileirochicopeltier.com.br/8-Documentos-de-1978/8_32/doc_1.jpg ) in the center of this page and marked by two dashes in red: “300 English dogs (Engelsen doggen) will be sent there…”. It is not enough to imagine, to invent, to write and to post… it has to prove !!! 14. The proponents of the OFB thesis further state that the copies in the above-mentioned item are “…useful on farms in the (Brazilian) countryside, away from contacts with foreign breeds“. With all due respect, I ask: how can the admirers of the OFB categorically affirm this “away from contacts“, that is, the non-existence of miscegenation with other breeds and even with mutts on these distant farms? For example, defenders of the OFB consider these two black dogs in the photos below as being OFB black color representatives. But at the same time they stated in another post (see in English Question # 448 in https://filabrasileirochicopeltierblog.wordpress.com/2018/11/07/post-591-ask-uncle-chico-178-about-such-an-original-fila-the-original-black-fila-and-two-photographs-of-a-dog-apparently-of-black-color-taken-in-1990-that-is-to-say-20-years-after-the/ ) that these photos were taken in the 90’s, that is, twenty years after the huge FB miscegenation in Brazil !!! Well, for me, I comment that the two dogs of the two photos below are nothing more than black-colored mutts, coming from crosses that occurred after the FB miscegenation !!! Alias, totally different from the fans of the OFB, I think that the PURO CAFIB Fila, after 40 years of selection and rigid genealogical control, is perfectly in line with the ideas of my great friend Dr. Paulo Santos Cruz, since it is the most important organizer of the Fila Brasileiro as a breed and that from 1978 consolidated all his knowledge in the Standard, Rules and in the CAFIB Journal called O Fila (see http://www.cafibbrasil.com/ofila.html ) . So, as I have written several times, there are many people of clubs, trends, ideas, colors and new theses that try in vain to take a ride and stick to the name of our Dr. Paulo, who is The CAFIB Master of Breeding and considered by all as the Father of the Fila. Forget: Dr. Paulo and all his knowledge was consolidated by him in the CAFIB !!! Period !!! 16.The defenders of the OFB thesis claim that “…the CAFIB standard filas although this entity retain a functional and much healthier and useful fila type than the CBKC fila, are also moving away from the old filas found in the middle rural (farms )”. However, the fans of the OFB responsible for the writing of this text have completely forgotten to explain how and why this “withdrawal” occurred. And, even more, they forgot to explain and prove this super vague and superficial statement. 17. The proponents of the new OFB thesis further state in the link in question that the dog “…Jumbo II became an ideal fila reference in terms of structure to be achieved by many CAFIB club breeders“; they commented on what they called the “event of the ears…” and also warned CAFIB of what they understood to be a departure from “…the original type“. For my part, I only have to comment, that I have never heard anything about these three vague statements above. With the word to the Board, judges and breeders of CAFIB and the editors responsible for writting this link. In fact, if these “alerts” were given more than 30 years ago, why did they take so many decades to react and create / invente the OFB thesis? 18. The proponents of the new OFB thesis claim that their “preference has been to rescue isolated genetics dogs on farms, but there are a few dogs of the CAFIB standard in the cross-breeding program of those filas that fit or show themselves sufficiently close to the characteristics considered desirable in the OFB standard…”. Also, that “…as for dogs of the CBKC standard, there is a remote possibility of using an animal only if the specimen fits in with the physical and temperament characteristics considered ideal not deviating from the pattern of the old filas...” , because they defend “… the rescue and maintenance of canine breeds with types called by him (the writer Vladimir Beregovoy) as Aborigines, that by having been molded more (!!!) naturally, almost without human intervention“. But I confess that I am afraid I have not been able to understand the use of CBKC-FCI dogs in the formation of OFB, since this is a decision that implies a total and serious incongruence, since no one has as proof of the real ancestry of dogs registered in these two clubs. Nor is human nonintervention and miscegenation with dogs of other breeds and even mutts in pedigree dogs issued by CBKC-FCI, reproached by the OFB’s own admirers, as well as in those dogs that live “away“ on such farms not yet determined or defined, as theoretically advocated by OFB admirers. I think it is precisely for this reason that it seems to me that the fans of the OFB have left a gap in the future, in the case of the birth of black dogs, to accept them in their breeding, since they are obviously derived from “black-filas” registered in the CBKC –FCI for decades, since these are also used in the formation of the new canine type called OFB. But I confess that this part of the text seemed to me very confusingly written, leaving me with many doubts of interpretation, because the writing has many comings and goings. Lack of clarity and objectivity. After all, it is very simple: either the fans of the OFB accept or do not accept the well-known “black-fila“. (i) After all what do you prefer to create? The PURE CAFIB … Fila ? Or the new canine type called OFB, as per the same link ? (vii) I am ready to continue this conversation in a friendly, transparent and sincere manner with any person, a supporter of the OFB or not, as long as they have education, respect and sound reasoning. That is, far from the lack of primary knowledge about the FB, of the lack of education and personal offenses, unfortunately very common in FB, mainly in the Facebooks. (viii) Stop one more personal achievement !!! It is enough !!! Enough of selfish, self-centered and individualistic people. Fila Brasileiro is much more important than its breeders !!! Let us respect him, his history and his breed purity. Enough of so much invention !!! I hope the proponents of the OFB thesis have noticed that, as always, I commented the link in question with education and arguments, respecting the diversity of opinions. I do not understand that we should be enemies in dealing with matters related to the FB because we think differently, but only opponents in ideas. After all, each one breeds and owns the dog that he / she understands. Be it a True and PURE CAFIB FILA Brasileiro, or from any other breed or even our dear mutt. My regards to all and happy 2019, including to the proponents of the OFB thesis. Chico Peltier. ← Post 602 – Perguntem ao Tio Chico nº 184 – Tio Chico contra-argumenta com educação, respeito, conhecimento e base histórica a apresentação da nova tese sobre um novo tipo canino denominado OFB, a qual foi disponibilizada publicamente na web.